Put the veal cheeks in a bowl and pour in the red wine. Cover the bowl and leave to marinate for twelve hours. 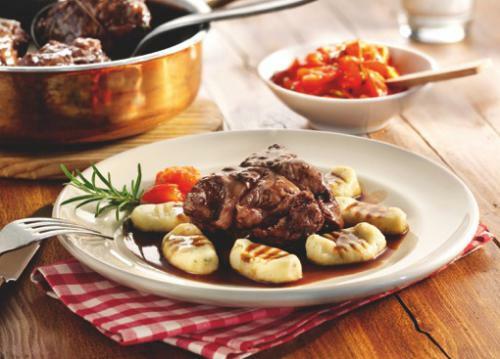 Remove the veal cheeks from the marinade, pat them dry and tie them together into small packets with kitchen twine. Heat the clarified butter in a Dutch oven, and briefly fry the cheeks on all sides. Remove from the pan. Pre-heat the oven to 180°C. Peel the onions and dice them. Clean the soup vegetables and wash them. Peel the carrots, parsley root and celery, and dice them. Slice the leeks. Put the onion and soup vegetables in the Dutch oven and fry while stirring firmly. Deglaze with the port and allow to thicken. Add the veal stock, red wine marinade and the veal cheeks to the Dutch oven. Add the salt, peppercorns and sprig of rosemary. Cover the Dutch oven and cook the cheeks for two hours in the preheated oven. Peel the potatoes for the gnocchi. Boil them for about twenty minutes in slightly-salted water until soft. Drain and immediately mash them in a bowl. Add flour, egg and rocket, and work into a dough. Shape the dough into a long roll on a floured surface, then cut into pieces about two centimetres long. Use a fork to make the characteristic gnocchi pattern in the dough. Boil the gnocchi for about five minutes in slightly-salted water until they rise to the surface. Remove the gnocchi from the water with a skimmer, put them on pre-heated plates and keep warm. Wash the beef tomatoes, remove the stalks and dice them. Heat the oil in a pan and fry the chopped tomatoes for about ten minutes, stirring occasionally. Season with salt, pepper and basil. Remove the cheeks from the bowl and strain the cooking juices and vegetables. Season the sauce to taste and thicken with some cold butter. Place the cheeks on the gnocchi and serve topped with the sauce. Serve the tomatoes as a side dish.